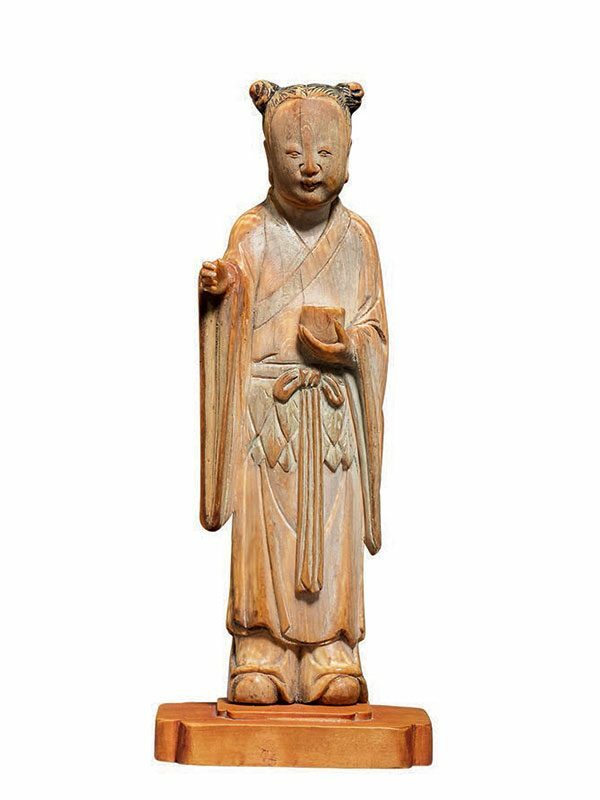 An ivory figure of a Daoist immortal, possibly Han Xiangzi, standing dressed in a layered robe and a feathered skirt, gathered with a belt, the ends of which are tied in knots. The figure turns slightly toward the right, with his right forearm half raised, whilst his left hand holds a bowl or mortar in front of his chest. His face is carved with a smiling expression, with the hair knotted in two chignons on top of his head. The ivory has acquired a mellow patina with age and retains traces of the original black pigment, visible in the hair. 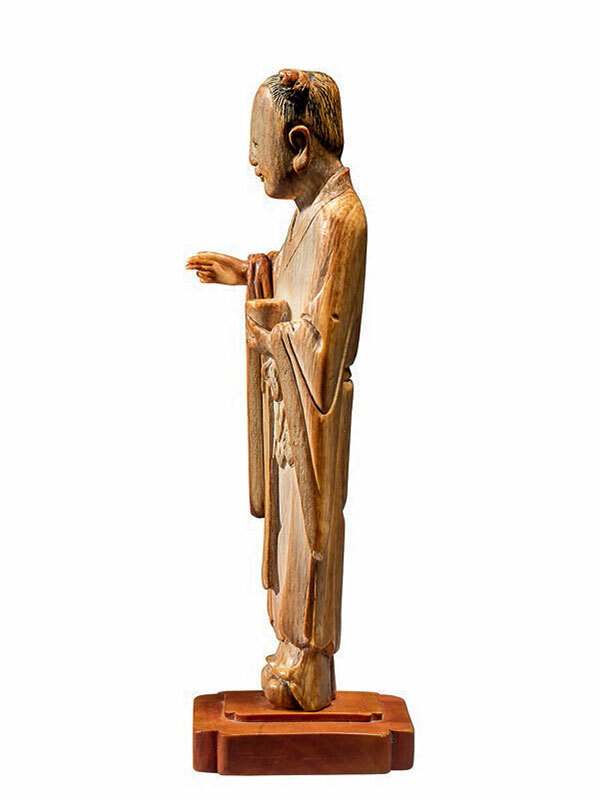 This delicately carved ivory figure represents one of the Eight Daoist Immortals, possibly Han Xiangzi, a distant nephew of the great Confucian statesman and writer Han Yu (768 – 824) of the Tang dynasty. As one of the Eight Immortals, he appears as a young man and often plays a flute. The present figure holds a mortar, which was used for crushing ingredients to go into elixirs of immortality. Ivory carved figures such as this were produced during the Ming and Qing dynasties at Zhangzhou, Fujian province and were mainly intended for the domestic market. Ivory figures of this fine quality and subject matter are rare. A closely comparable ivory figure of Han Zhonli, dated to 1580 – 1644, holding a tortoise supported on a fan and wearing a similar feather skirt is in the collection of the Victoria and Albert Museum. An ivory figure of He Xiangu, dated to the same period, is comparable in that she holds a mortar in her hands. This figure is illustrated in Chinese Ivories from the Shang to the Qing. Two further comparable ivory figures of Han Xiangzi playing a flute, both larger in size and dating from the same period, are respectively in the collection of the British Museum and the Muwen Tang collection.